Just when you need it the most, Lonicera fragrantissima, also known as Winter Honeysuckle bursts on the scene with its powerful scent and dainty little creamy flowers. The blooms provide pollen and nectar to bees who are foraging on a winter’s day. When you plan your garden, get used to including other’s needs, especially our pollinators. Winter can be a bleak time for overwintering butterflies and bees. Dr. William Welch suggests planting Winter Honeysuckle by a gate so when you brush by it you can enjoy the scent. It can be grown in partial shade or full sun. For a look at it in full sun, click here. If you arrive early at the next *Texas Discovery Garden sale, you might be able to take home your own small start of this fast growing fragrant bush. 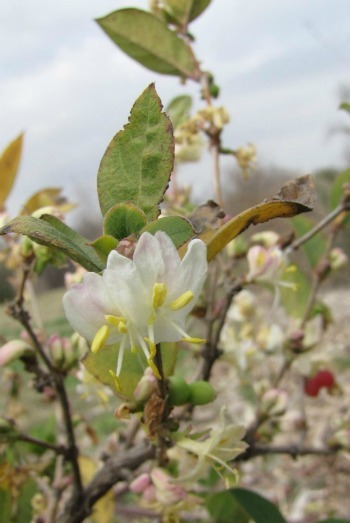 More info about Lonicera fragrantissima right here on Dallas Garden Buzz! Posted in Winter and tagged Dallas County Master Gardeners, Texas Discovery Garden, Wildlife Habitat, Winter Honeysuckle. Bookmark the permalink. 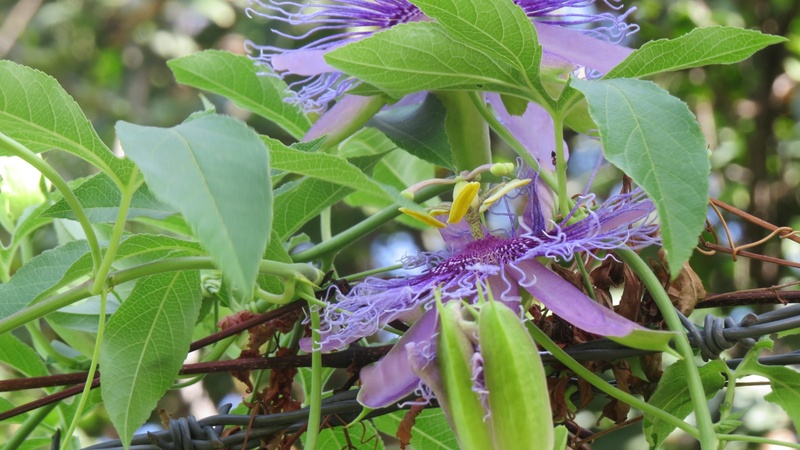 Have you always wanted to grow a passion vine but have too much shade to grow the showy purple Passiflora incarnata? Or perhaps you have a butterfly garden and are interested in providing one of the host plants for Gulf Fritillary, Julia and Zebra Longwing butterflies? Well, if you don’t mind having a Lilliputian passion flower that is only about an inch in diameter, then Passiflora lutea is for you. Passiflora lutea is also known as yellow passionflower, though the color of the flowers may range from chartreuse to off-white. It is a native plant in Texas that blooms from May through September. 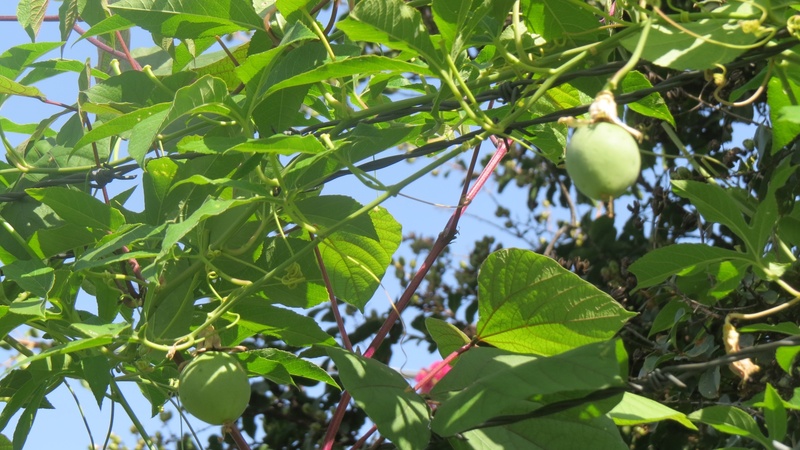 In Dallas it is considered a perennial herbaceous climbing or trailing vine that can reach 15 feet in height. Here it will loose its wide shallowly-lobed leaves in the winter but it comes back reliably in the spring. The fall leaf color is a shade of yellow. Though considered somewhat drought tolerant once established, P. lutea prefers moist, rich soil. Its flowers are followed by small black berries, which some say are edible but not very tasty. I have P. lutea growing wild in my shady yard near White Rock Lake. If I don’t keep an eye on it, the vines can grow rampantly in some spots. However they are very easy to pull off from wherever they are growing. 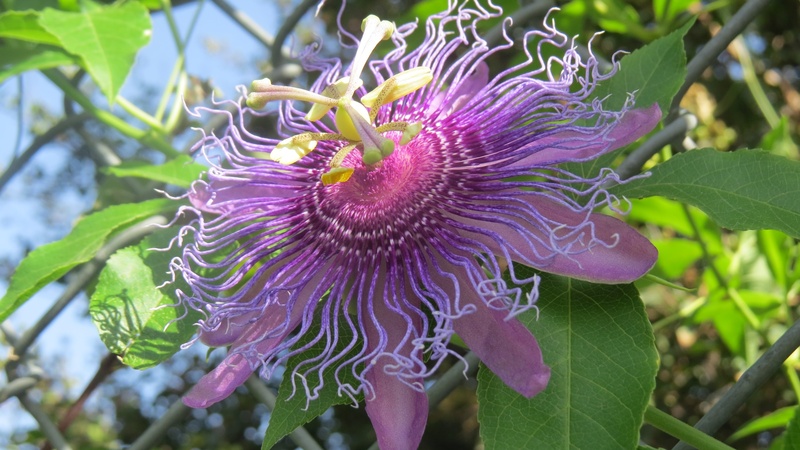 I also have one pot of purple Passiflora incarnata and have noticed that the Gulf Fritillary butterfles tend to prefer to lay their eggs on P. incarnata rather than P. lutea. However, one of my neighbors had P. lutea growing in her yard and had many caterpillars feeding on it. Yellow passionflower is not often found in most garden centers. However, Roseann Ferguson says that the annual plant sale at Texas Discovery Gardens will carry it. The dates for this year’s fall sale are September 15-16 with the member-only sale taking place on the 15. Many of their unusual plants sell out quickly, so get there early and consider becoming a member. Further information about the plants that will be for sale will be posted on Texas Discovery Garden’s website (www.txdg.org) closer to the date of the sale. Posted in Vines for Texas and tagged Butterfly Host Plant, Dallas County Master Gardeners, dallas gardens, Shade Plants, Texas Discovery Garden. Bookmark the permalink. As with many plants, Tagetes lemmonii is known by so many common names (Copper Canyon Daisy, Mexican Bush Marigold, Mountain Marigold, Mount Lemmon Marigold, tangerine-scented marigold, and Perennial Marigold) that it is almost easier to refer to it by its Latin nomenclature. Yet even its Latin name has a fascinating story behind it. Tagetes lemmonii is native to the high mountain canyons of northwestern Mexico and southern Arizona. A finely leafed plant with a very distinctive aroma often described as minty and fruity, lemon and tarragon, or (for some people) just plain “Yuck,” it can grow to a size of four to six feet tall and can spread to six to ten feet. It can be sheared back however. It grows best in full sun in well drained soil. It can be grown in part shade, though it may get leggy and have fewer blooms. Once established it needs little to no supplemental watering. If grown in an area where deer are a problem, deer will definitely avoid it. However pollinators, including yellow sulpher butterflies and beneficial insects, are drawn to it. T, lemmonii is considered to be photosensitive and blooms with bright yellow daisy-like flowers in the fall, winter and early spring when the daylight hours are shorter. In mild winters, it provides a welcome bright spot in the garden since the flowers can last for quite a while. However in colder winters, it will sometimes die back to the ground but return in the spring. There is one word of caution when pruning or working with Tagetes lemmonii. Some people are extremely sensitive to the oils in the leaves and can develop a painful, itchy rash when their skin is exposed to sunlight. Sometimes this rash can continue for several days. Therefore it might be best not to plant Tagetes lemmonii where it can be brushed against, be sure and wear gloves and long sleeves when working with it, or at least wash your skin well with soap and water after handling. Picture by Roseann from Texas Discovery Garden. Posted in Perennials and tagged Copper Canyon Daisy, Dallas County Master Gardeners, Dallas Perennials, deer resistant plants, drought tolerant plants, Tagetes lemmonii, Texas Discovery Garden, The Raincatcher's Garden. Bookmark the permalink. Our progeny is not sociable. Ana tapped on the glass of his cage, and the very young, very little, very spotted Yellow-Bellied Racer tried to bite her. Ana, Judy and I were checking out Horticulture Director Roger Sanderson’s herpetarium at the Texas Discovery Gardens at Fair Park. It’s the new home of our garden’s snake. Correction: Ana and I were looking attentively at the slithering residents. Judy was watching from a very respectful distance. 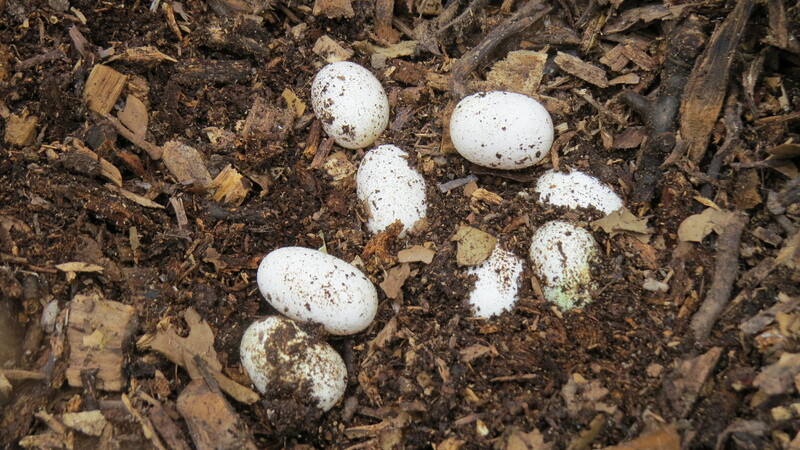 Anyway, there he was, the sole hatchling of 9, some say 10, snake eggs Hans discovered in June at the bottom of the garden’s compost pile. Hans was excited. Other Gardeners shrieked like 14-year-olds at a rock concert. If he makes it back to 2311 Joe Field Rd., the racer has long lost cousins to look up at the garden. Mama Racer chose Cindy’s compost piles for her nest last summer, too. Luckily we haven’t seen hide nor hair of her or the kids. At the moment, our guy is about as round as your little finger, maybe 10 inches long, and covered with brown spots and blotches, much like a newbie whitetail deer. By his third birthday, he’ll trade the spots for a solid blue-grey back and a yellow belly, thus the moniker. Frogs, lizards, small snakes, rodents, birds, and insects are on the menu. Racers aren’t constrictors or poisonous, but are very fast on their feet belly. Don’t know that I’d want to get up close and personal. When captured, Racers struggle violently and bite. If all else fails, nasty stuff is expelled through their vents. Nope, Racers can wind their quick way through the creek and brush without me. More about long lost cousins click here. 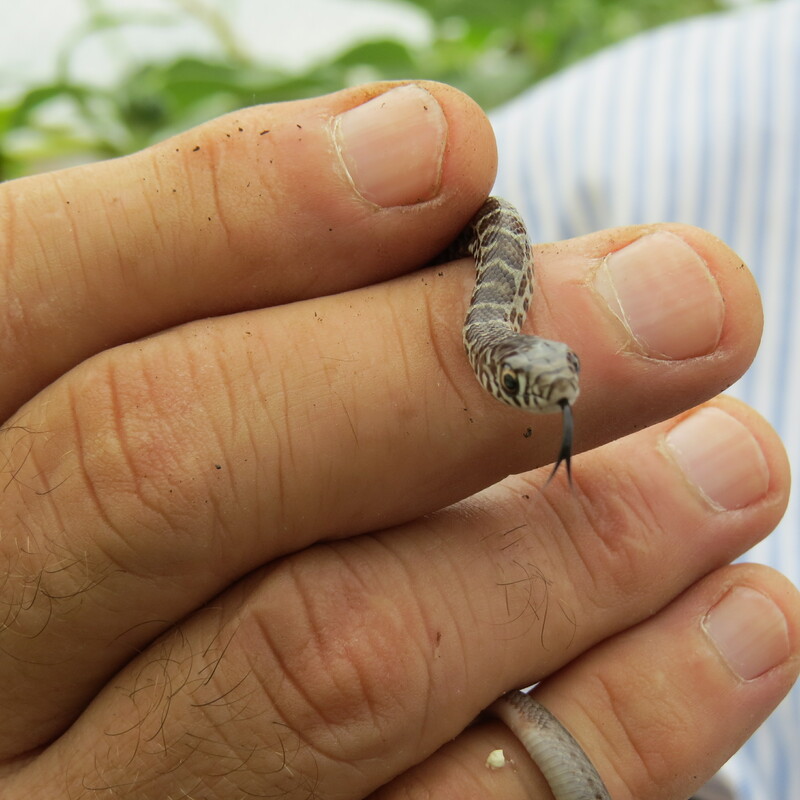 Posted in Wildlife Habitat and tagged snakes, Texas Discovery Garden, Yellow Bellied Racer. Bookmark the permalink. It’s nice to have something blooming in February and it’s nice to have friends like Texas Discovery Garden. We had all gathered around our Winter honeysuckle to inhale its lovely scent and had questions about this plant. Roseann had forwarded me your e-mail yesterday and I hadn’t realized until then that ours too is in bloom now! I had gone out to check on it and never got back to respond. As you already know it’s a non-native (E. China)so might be discouraged by some purists for planting. Although it is listed as “invasive” by some sources, most gardeners would disagree, as it doesn’t produce many berries and only suckers for a short distance from the bush. Perhaps in the moist woods of eastern U.S. it might escape cultivation, but doubtful here in our fairly dry habitat. Probably it has received a bad rap from its many relatives – like the highly invasive Japanese Honeysuckle which is a VINE or Amur Honeysuckle, a bush that used to be fairly invasive in this area. Anyone that would rather not try it, might try the native White Honeysuckle (Lonicera alba) that has very similar leaves and not quite so bush-like. I’m not sure of its bloom time, but it probably doesn’t produce the profusion of strong scented flowers this early in the season like the Winter (or Fragrant) Honeysuckle. As a landscape plant, it apparently is not picky as to soil type and is relatively drought tolerant. It does have some other distinct benefits for a North Texas landscape. The flowers this early in the season do provide a rare nectar source for bees and butterflies that venture out on warm days during the winter months (Question Marks, Goatweeds, and Mourning Cloaks are local butterflies that overwinter here as adults). It is supposed to be an excellent bird attracting bush according to some sources for the berries. But since ours rarely fruits, it is often the flowers that attract the birds! They apparently eat the flowers for the nectar and spit out the petals. One interesting comment I read is that it is sometimes referred to as “Pouting Flower” as the paired flowers face in opposite directions! Posted in Winter and tagged Texas Discovery Garden, Texas Discovery Gardens, Winter Honeysuckle. Bookmark the permalink.